A Match Made in the Mediterranean! 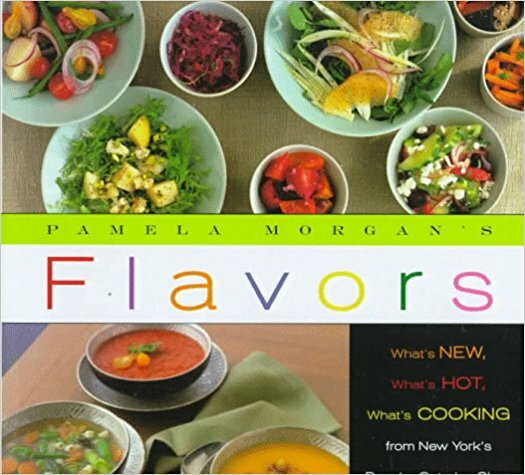 During the old Flavors Catering and Carry Out Days, when I had the retail store on 18th Street, we used to sell a very popular olive oil cake. 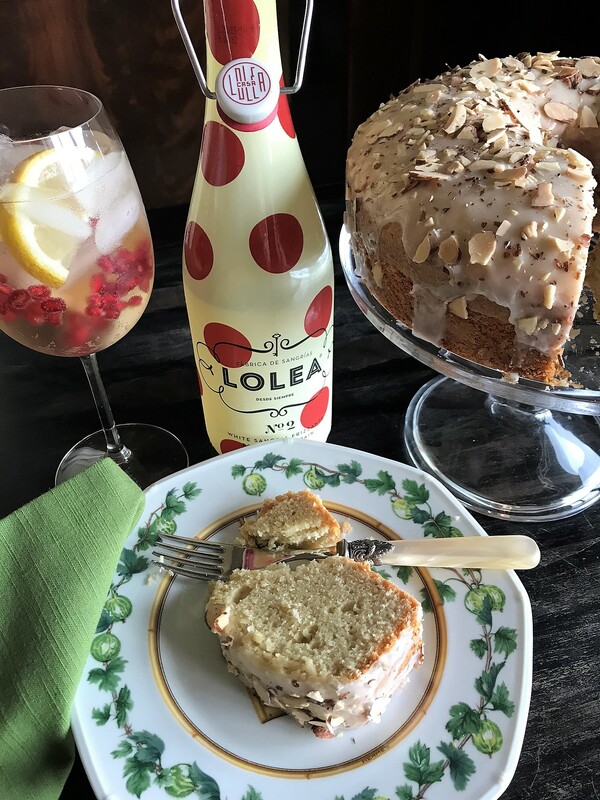 We also made a white sangria that was always a hit during the summer months, so when I was looking to pair a dessert with this amazing Lolea Sangria, I immediately thought of recreating that dessert. This cake is moist because of the olive oil and I love the flavors of almonds and lemon. It’s those Mediterranean flavors that pair so well with the Sangria. You’ll want to use a 10-12 cup bundt pan for this cake. Make sure you don’t overcook it as it will dry out–unless you’re looking for an excuse to indulge in more icing! Whisking away the dry and wet ingredients! Preheat the oven to 325. Brush your bundt pan with olive oil, dust with flour, and tap out the excess. Whisk the all-purpose & almond flour with the baking powder and salt in a medium bowl and set aside. 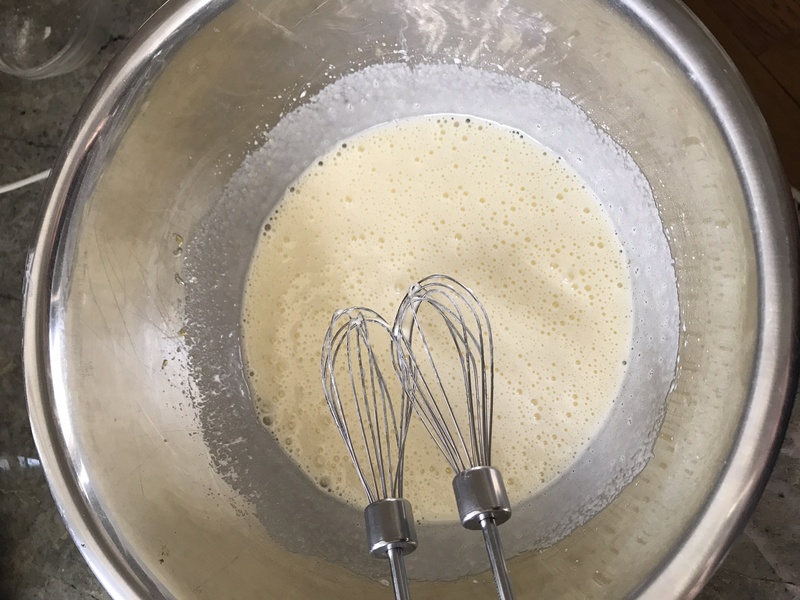 Combine the sugar and eggs in a large bowl, beat with a mixer on medium-high speed until thick and pale yellow, about 3 minutes. Reduce the mixer speed to medium and slowly beat in the olive oil until the batter is smooth. Beat in the vanilla and almond extracts as well as the lemon juice and zest. Reduce the mixer speed to low and beat in the flour mixture in two additions, alternating with the almond milk, until just combined. Pour the batter into the pan and smooth the top. Bake until a toothpick inserted into the middle comes out with a few moist crumbs, 50 to 60 minutes. Transfer to a rack and let cool 15 minutes in the pan. Loosen with an offset spatula, then invert onto the rack to cool completely. 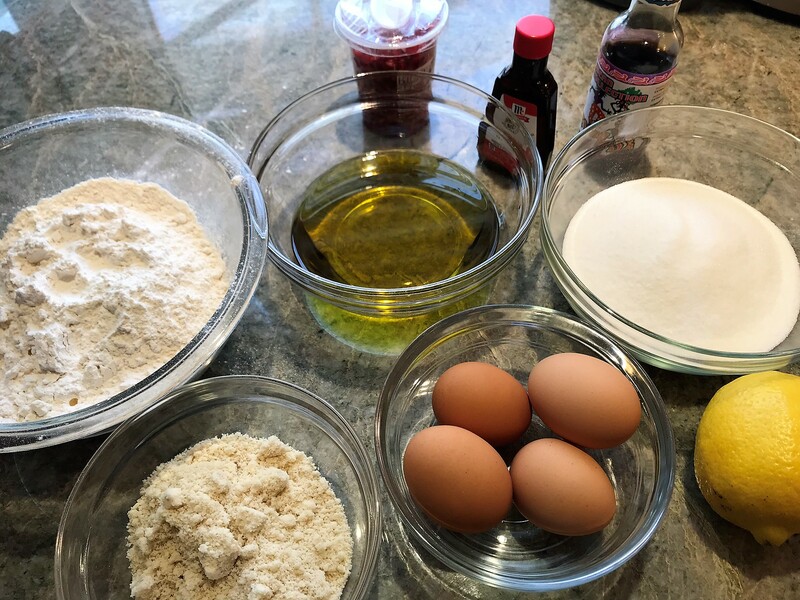 Whisk the confectioners' sugar and milk in a bowl until smooth. Stir in the extract and lemon juice. Drizzle the glaze over the cake, letting it drip down the sides. Sprinkle with chopped almonds. Let the glaze set, about 10 minutes.